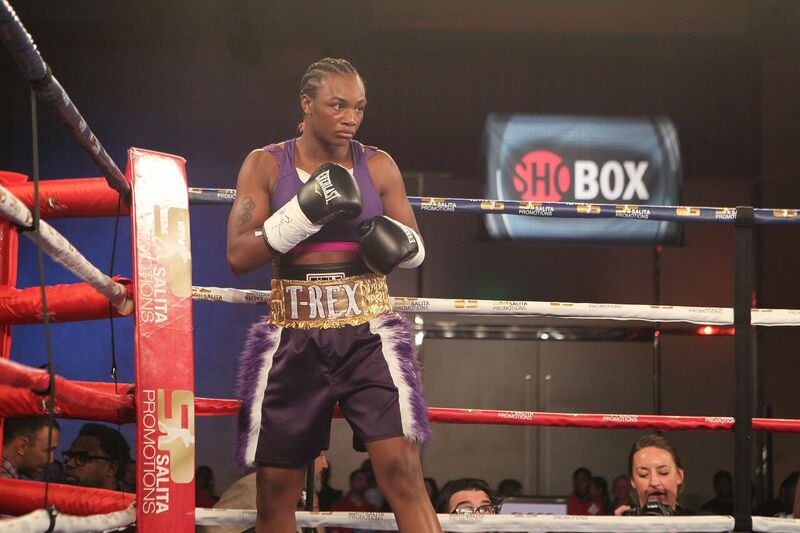 Unified Women’s Super Middleweight World Champion Claressa Shields dominated previously undefeated Tori Nelson en route to a 10-round unanimous decision in the main event of ShoBox: The New Generation Friday on SHOWTIME from Turning Stone Resort Casino. Shields controlled from opening to closing bell, sweeping 100-90 on all three judges’ scorecards in the first 10-round distance fight of her career. The 2012 and 2016 Olympic Gold Medalist out-landed Nelson 225-81 with her total punches, 186-70 in powers shots, and connected at a 44 percent clip with her power shots compared to just 20 percent for Nelson. Shields advanced to 5-0 with two knockouts in what was likely her final fight in the super middleweight division. The 22-year-old now has her sights set on the middleweight division where she will eventually target undefeated and Unified Women’s Middleweight World Champion Christina Hammer, who was ringside Friday in Verona. “I have to drop down and see how I feel (first),” Shields said. “I think I could make 160 easy, I’m going to be bigger and stronger than any girl. Hammer, who is expected to fight in a co-featured bout on the next Shields card, was interviewed by SHOWTIME analyst Steve Farhood and expressed excitement to make her U.S. debut and eventually face the American champion. The former world champion Nelson (17-1-3, 2 KOs) became the 173 undefeated fighter to suffer their first professional on ShoBox: The New Generation. “I’m not happy because I didn’t win, but other than that I thought I executed pretty well,” said the 41-year-old Nelson. “I gave her a better fight than she was expecting. In the ShoBox co-feature, Jesse Hernandez narrowly defeated Ernesto Garza via split-decision in an action-packed fight that was scored 95-94 Hernandez, 95-93 Garza, 97-93 Hernandez. After a close first round, Garza floored Hernandez with a flush left hand to the nose in the closing moments of the second round. Hernandez recovered, and while the middle rounds featured tremendous back-and-forth action, Hernandez seemingly had no trouble walking down Garza, who’s punches seemed to lack any real power. Garza (9-3, 5 KOs) found a second wind and seemed to pick up the eighth and ninth rounds until Hernandez roared back in an excellent 10th and final round that featured 178 total punches. Hernandez (11-1, 7 KOs) landed 50 percent of his power punches and connected on 40 percent of his punches compared to just 28 percent for Garza, however he threw just 719 total punches compared to more than 1,000 by Garza. “I think it should have been a unanimous decision,” Hernandez said. “I’ve always been a slow starter and I feel like I lost the first two rounds, especially with the knockdown. But I won pretty much every round after that, I maybe lost three rounds. “I’m not completely happy with my performance. I have to control my distance and my range a little bit better. I need to go back to the gym and work on those things. Before the summer comes I hope to have another fight and I hope it’s on SHOWTIME. “I thought it was a bogus decision,” Garza said. “I don’t understand that last judge’s card. I was happy with everything that I did. I executed well and did everything I needed to do to win the fight. Undefeated Uzbekistan power-puncher Shohjahon Ergashev handed Sonny Fredrickson the first loss of his career with an impressive third round TKO in the opening bout of the ShoBox telecast. The win over the top-10 ranked Fredrickson extended Ergashev’s perfect record to 12-0 with 12 knockouts. The 26-year-old pressed the action from the beginning, negating Fredrickson’s five-inch reach advantage with a steady diet of well-timed, crisp punches. Ergashev landed a wide left to the head that stumbled Fredrickson in the opening minute of the third and continued to tee-off as his opponent wobbled against the ropes With Fredrickson (18-1, 12 KOs) unable to defend himself and eating a series of brutal lefts, referee Benjy Esteves stepped in to stop the bout at 1:58 of the third. All of Ergashev’s 61 connects in the bout were power shots, and he connected on 77 percent of his power punches in the third and final round. “The ref saved him,” Ergashev said. “If he let him stay on his feet any longer I would have knocked him out. He couldn’t handle my power. “At this stage of my career, I am in the best shape of my life and the best I have felt. This is my time right now, especially because I am training with Rick (Phillips) and (Javan) Sugar (Hill Steward). That’s what leads to all of my knockout power. Fredrickson, who became the 172 fighter to suffer his professional loss on the prospect developmental series, suffered a jaw injury in the bout and was unavailable for comment. Friday’s tripleheader will replay on Monday, Jan. 15 at 10 p.m. ET/PT on SHOWTIME EXTREME and will be available on SHOWTIME on DEMAND® and SHOWTIME ANYTIME®.